Moist, flavorful, cake filled with fresh, ripe peaches and a sugary crust. The perfect dessert for summer. Living here in Georgia, we always have peaches in our house during the summer. There is nothing better than a ripe, juicy peach on a summer day. There are so many ways to use this delicious fruit like peach melba parfaits , peach nectar bars and peach honey bbq ribs. My favorite way to use peaches is in DESSERTS. 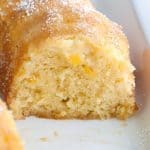 I have a weakness for SWEETS and this peach bundt cake is one of my favorites! 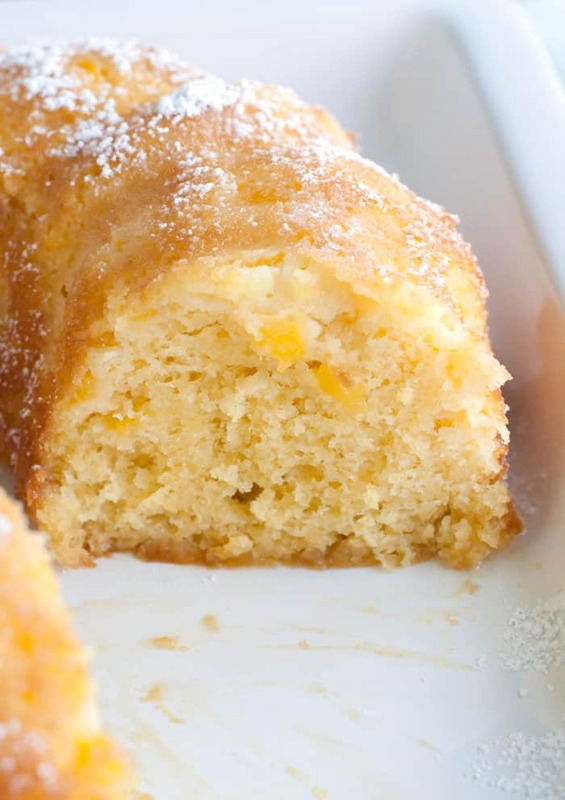 This bundt cake is a spin on apricot nectar cake. Using peach nectar instead, really gives the cake a wonderful peachy flavor. You can usually find peach nectar in the juice aisle. To make the cake, mix peach nectar with a box of yellow cake mix, sugar, eggs and oil until combined. Don’t forget to add some fresh diced peaches! Remove the fuzzy skin from the peach and dice them small. Before adding the peaches to the batter, I toss them in just a little bit of flour so they don’t sink to the bottom of the cake. Grease the bundt pan with shortening and then dust it with sugar. Dusting with sugar gives this cake a crackly, sweet crust. Bake for approximately 40 minutes and then let cool for 10-15 minutes before removing from pan. To finish I like lightly dusting the top with powdered sugar. This cake is AHHHHmazing on it’s own but sometimes I like to serve it alongside a scoop of vanilla or praline ice cream. 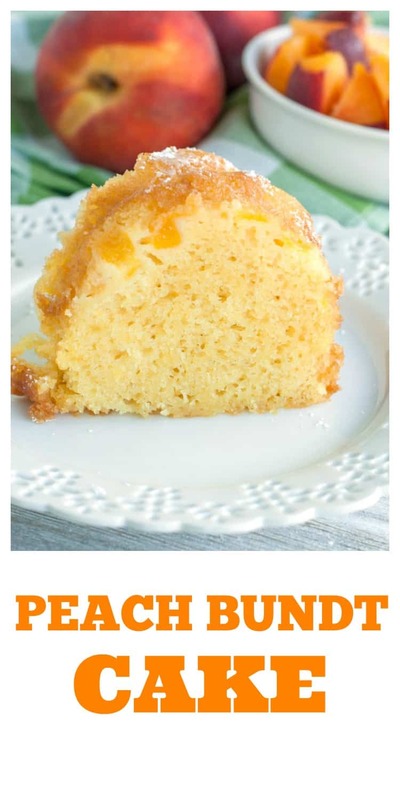 I hope you are having a wonderful summer and enjoy this flavorful bundt cake. Moist, flavorful, cake filled with fresh, ripe peaches and a sugary crust. Do you need that perfect summer dessert? Here it is! Preheat oven to 325 degrees F. Grease bundt pan with shortening. 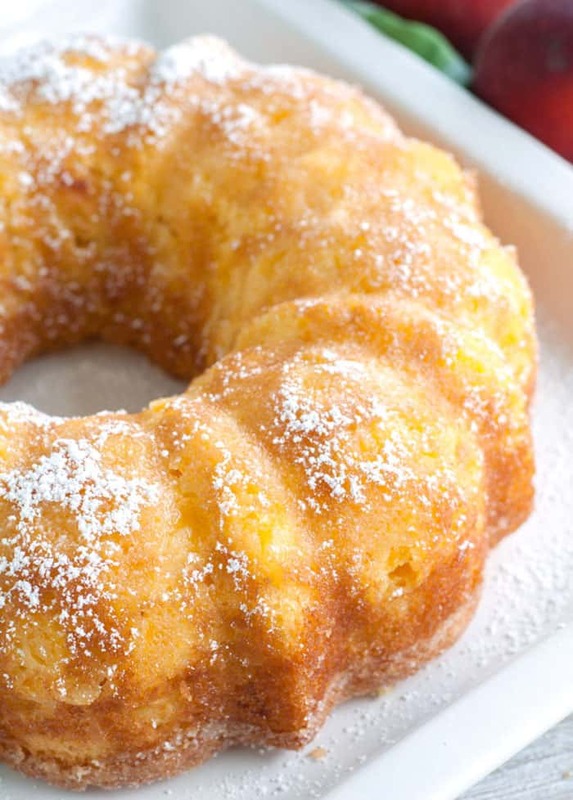 Sprinkle 1 tablespoon of sugar in the bundt pan and toss it around until it cover the pan. With an electric mixer, mix cake mix, peach nectar, oil, eggs and sugar until combined. Sprinkle diced peaches with flour and toss until they are coated. Stir the diced peaches into the batter. Pour batter into prepared bundt pan and bake for 40 minutes. Remove from oven and let cool for 10-15 minutes. Turn cake out on a serving plate and dust the top with powdered sugar. Want more easy, family friendly recipes? Be sure to stop by Food Lovin’ Family and say hi.